When fastening the seat belt (buckle switch on). Inspect the continuity and resistance between the terminals. 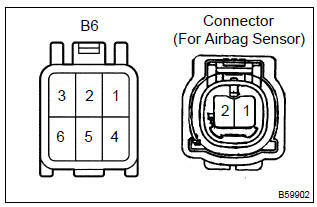 If the result is not as specified, replace the inner belt. When releasing the seat belt (buckle switch off). 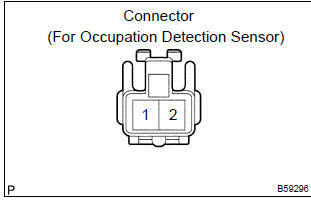 short between connector terminals 1 and 2 for the occupation detection sensor (seat is occupied). When fastening the seat belt (buckle switch is on and seat is occupied). 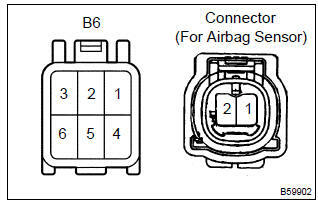 Inspect the continuity between the terminals of the connector for the warning switch. When releasing the seat belt (buckle switch is off and seat is occupied). 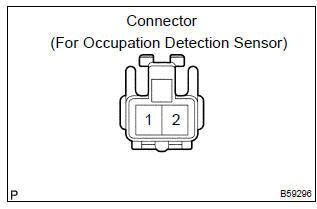 Disconnect the occupation detection sensor connector (seat is not occupied). When fastening the seat belt (buckle switch is not on and seat is occupied). When releasing the seat belt (buckle switch is not off and seat is occupied).